Hannah Genders discovers two special show gardens. I always love my annual visit to the Chelsea Flower Show, and this year was no exception. My press pass allows me to get in early so my long-suffering friend Kaaren (who I stay with in London) accepts now that I’ll be up at the crack of dawn to make the most of the quiet space inside the showground and the opportunity to get around the main show gardens and take photos before the crowds. I try to get there for 7am or soon after and initially wander round taking it all in and seeing what inspires me to want to write. This year it took a little longer, not because the show gardens on Main Avenue were not wonderful – they were – but because I was looking for that special story that sometimes takes a little longer to find, and I did find it in two gardens this year. The first was in the “Fresh Gardens” category. These are meant to encourage new ideas and styles, creating a fresh way of looking at plants or design. “The Garden of Potential” (above left) did this for me – and not just for its overall design, which was interesting and intriguing with a large glacial boulder balanced precariously on the overhead framework. It was the plants that really caught my eye; they were so unusual and it turned out they had been collected from seed all over the world by Sue and Bleddyn Wynn-Jones. Sue and Bleddyn are modern-day plant-hunters – they propagate the seed from plants they have discovered and grow the plants on in their nursery, and this garden was packed full of their finds. The young designer behind the garden was Dan Bristow. He grew up near Sue and Bleddyn in Snowdonia and had always been inspired by what they do. He is returning there after training and working in London for the past few years. Dan has a horticultural and design background – his Austrian mother trained as a landscape architect and insisted he learnt plant names in English, Latin and German, and his father is a plantsman and trained at Kew, so the passion really is in his blood. He has been on some world travels with Sue and Bleddyn to collect these rare and unusual plants and this gave him the idea to create a garden at Chelsea to show them off. It was fascinating walking around the garden with Bleddyn while he told me where the plants had been found. He and Sue have travelled to China, India, Nepal and Vietnam to name a few countries, but most recently concentrated on Colombia as it has the most diverse flora in the world. For example; there is a plant called Beesia calthifolia, grown mainly for its distinctively veined leaf – it thrives in shade and Bleddyn had collected this one 4,000 metres up a mountain in China. A Pachysandra unlike any I’ve seen, with scented flowers and named after their nursery, was called ‘Crugs cover’ and there was also a lovely pink-striped Euphorbia; it really was a delight. Although Dan’s parents had helped financially, this garden had no large sponsor and was built by Dan, his fiancé Sarah (they were getting married just five days after Chelsea) and friends. It took them nine days to put it together and has probably cost them in the region of £30,000. This was Dan’s first show garden and they were awarded a Silver Gilt medal, an excellent medal for a first garden. 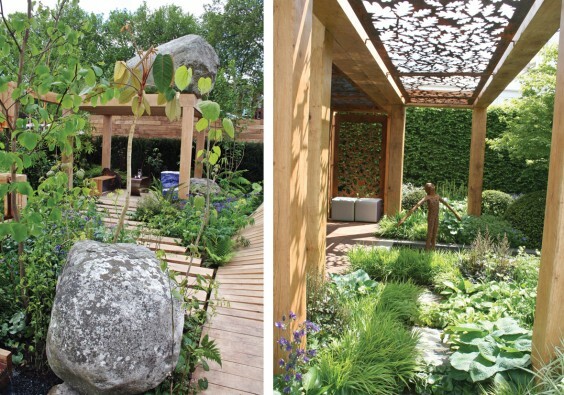 The second garden that inspired me was Chris Beardshaw’s (above right). He had done a garden for Great Ormond Street Hospital, but not for the children as such. This garden was for their parents, a place of reflective calm to regenerate and restore them as they sought to support their children and remain positive throughout the difficult journey of having a child undergoing treatment in hospital, often for a life-threatening illness. Chris’s garden was designed for shade as its final home at the hospital is in a courtyard surrounded by tall buildings – in fact the whole garden will need to be craned over ten-storey buildings and on to the roof of a two-storey building; a real engineering challenge. The central pool was surrounded by stunning trees: Acers, a Cornus and a tulip tree, all of which would be sited over structural pillars for support at the hospital location as each tree weighs about three and a half tonnes and will be planted on a roof! The layout was unfussy and calm, with lots of easily-recognisable plants such as hostas and iris, but they all looked right in the dappled shade. As this was a real garden, some of the plants were not in full flower but shown as they would be in mid-May, just budding up. The area at the back of the garden is enclosed by a beautiful oak structure with an oak leaf screen above that cast wonderful shadows, while the child sculpture is the central focus as it sits in the middle of the rill pool. So why did these two gardens inspire me? The first because it’s so great to see young talent coming into the Chelsea scene, especially someone like Dan who clearly lives and breathes plants. The second because I believe what Chris is doing is the Chelsea of the future, a much more sustainable way to do a show garden – i.e. create a garden for a particular setting, take it to Chelsea to tell its story and then rebuild it for people who really need it.